A recent report published by the BBC points more fingers towards Indian security agencies for actually staging the entire Mumbai drama. The stories craft by the Indian electronic and print media were absolutely absurd from the very beginning. Now we have it that the guests who had trapped themselves inside hotel rooms for safety were actually instructed by policemen to leave the building while the fighting raged on. Several other things have been left unanswered, including the gross failure of Indian security and intelligence agencies that such a big terrorist attack happened right under their nose, in a country aspiring to become a regional superpower. All these questions that raise in one's mind have been discussed before here and at several other forums. So much so that the Indian minister for minorities had to resign for raising the issue of Mr. Karkare's suspicious killing at an unknown location on the same day – the senior Indian policeman who had exposed the masterminds of the Samjhota express bombings and held a Hindu serving Indian army Colonel for the same. Yet India is still pushing forward with its absurd, concocted story of the deadly Mumbai terror attacks holding Pakistan responsible, while all evidence points towards it as being a staged drama by Indian Hindu extremists who have penetrated Indian state machinery in large numbers. Following is the BBC news report, in which guests at the Taj hotel have testified against the Indian police.. Guests trapped in a Mumbai hotel seized by gunmen last month have told the BBC they were given instructions by police that may have led to more people dying. Police told a group hiding in the Taj Mahal Palace hotel that it was safe to leave the building, a survivor said. But members of the group were shot and killed by militant gunmen as they were making their way out. The senior policeman in charge of the operation in the hotel has denied the allegations against his officers. A prominent Mumbai gynaecologist, Dr Prashant Mangeshikar, was trapped in the Taj Mahal hotel along with hundreds of other guests as gunmen stormed into the building, firing indiscriminately. Terrified, he and others barricaded themselves into a room and waited. Eventually, in the early hours of the morning, police officers made it through to where they were hiding and told people it was safe to leave the hotel because the gunmen were cornered on another floor. Some went ahead but Dr Mangeshikar held back. "I was a little suspicious that the police were actually sending these guys down a different route where the terrorists were supposed to be," he said. "I refused to move away and the people who ran ahead of me, about 20 or 30 of them, all of them died." A dress designer from the city says her aunt was shot dead and her cousin seriously wounded because they followed police instructions to try to leave. The designer, Shilpa, described the police conduct as disgraceful. They had no right, she said, to risk people's lives. The senior policeman in charge of the operation in the hotel has denied these allegations against his officers. But they add to growing criticism of the police and how they responded to the attack in which more than 170 people were killed. The move seems to be one to fuel more hatred against Pakistan by increasing the number of deaths as a result of this barbaric act. Shame on you India! You kill your own people to wage war against Pakistan! And God knows that you cannot sustain a full war for no more than 15 (FIFTEEN) days – given the recession that has hit your economy too. A survivor who had been hiding at the Taj Mahal Palace hotel said some guests were shot and killed by the militants after police said it was safe to leave. The attacks left at least 173 people dead, including nine of the 10 gunmen. India blames Pakistan-based militants Lashkar-e-Taiba (LeT) for the 26 November attacks. LeT and the Pakistani government have denied any involvement. 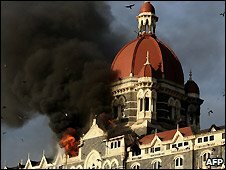 Two of the hotels caught up in the attacks, the Trident-Oberoi and Taj Mahal Palace, are to re-open on Sunday. Armed guards and sniffer dogs have been stationed at both hotels and X-ray machines are to screen guests' bags.
" I refused to move away and the people who ran ahead of me, about 20 or 30 of them, all of them died "
"I was a little suspicious that the police were actually sending these guys down a different route where the terrorists were supposed to be," he told the BBC's Adam Mynott. But they add to growing criticism of the police and how they responded to the attack, says our correspondent. The government of India's Maharashtra state has already announced an investigation into two senior policemen over alleged failure to act on warnings of the attacks. India's interior minister and Maharashtra state chief minister have already resigned. Pakistan's President Asif Ali Zardari said claims that the sole surviving attacker had been identified by his own father as coming from Pakistan had not been proven. The man has been named as Mohammed Ajmal Amir Qasab and is in Indian police custody. on 21 December at 1200, 2000 or 2100 GMT.